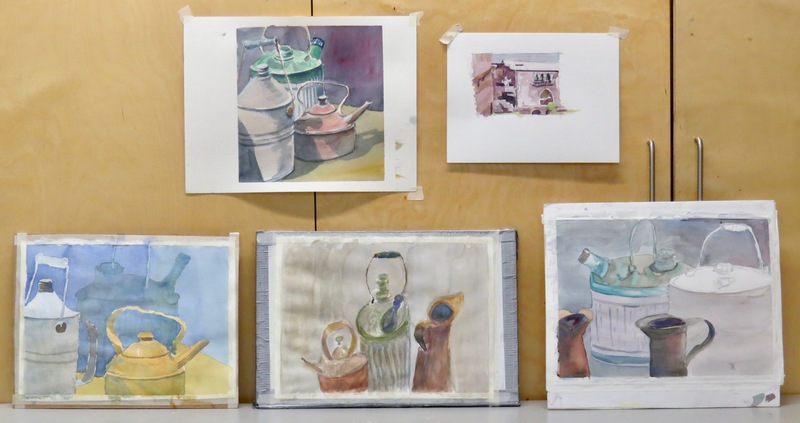 Winter Wednesday Watercolour Class at DVSA – Week Three! Our colours were complementary and our focus was on soft edge last Wednesday evening at the Dundas Valley School of Art. 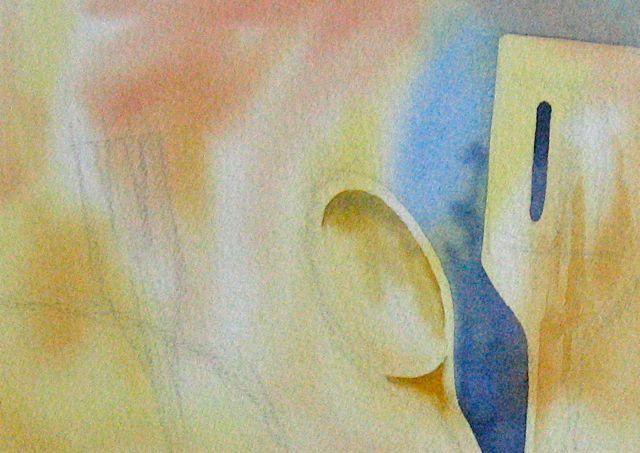 The ability to create soft edges is a key element of watercolour painting. I showed the students how to ‘inject’ a darker value or colour into a lighter wash. Both washes are wet when they touch each other and timing is critical. I painted several swatches, including some examples of what not to do. 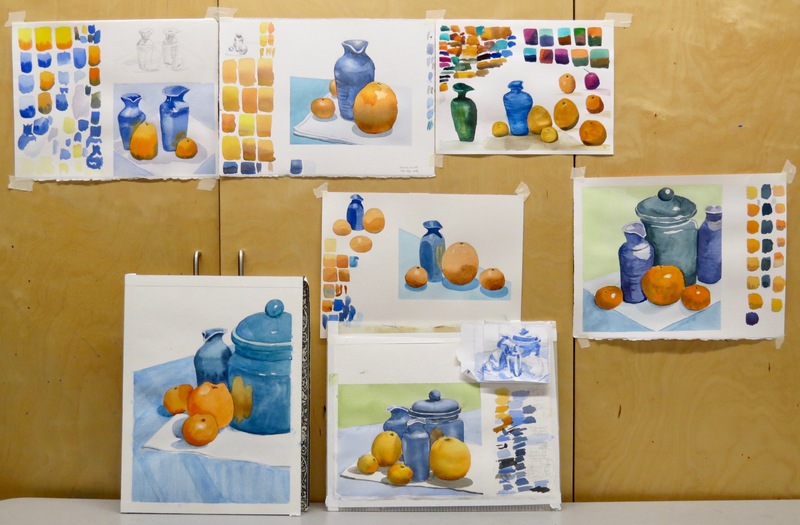 Then, I applied the basic technique to a few studies of oranges and the blue pitcher. This was review for some of the students and new to others. It takes a lot of practice but it’s a very important tool in any watercolour painter’s toolbox. Practice and process. Repetition. Everyone worked hard and thoughtfully. We’ll continue to explore soft edges in the weeks to come. 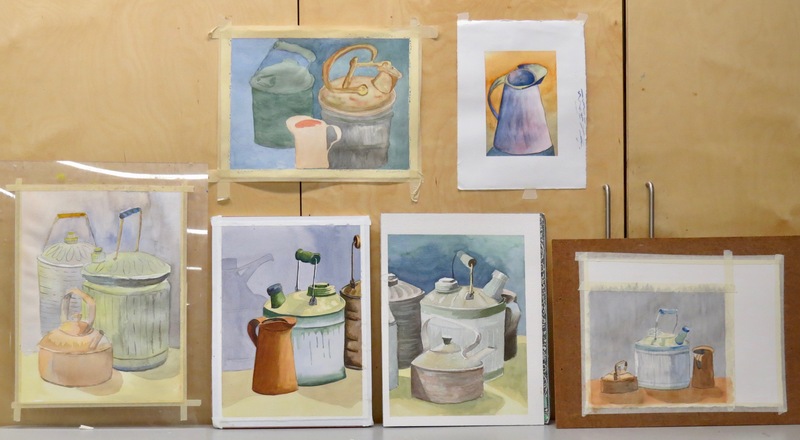 Winter Watercolour at DVSA – Week Two! 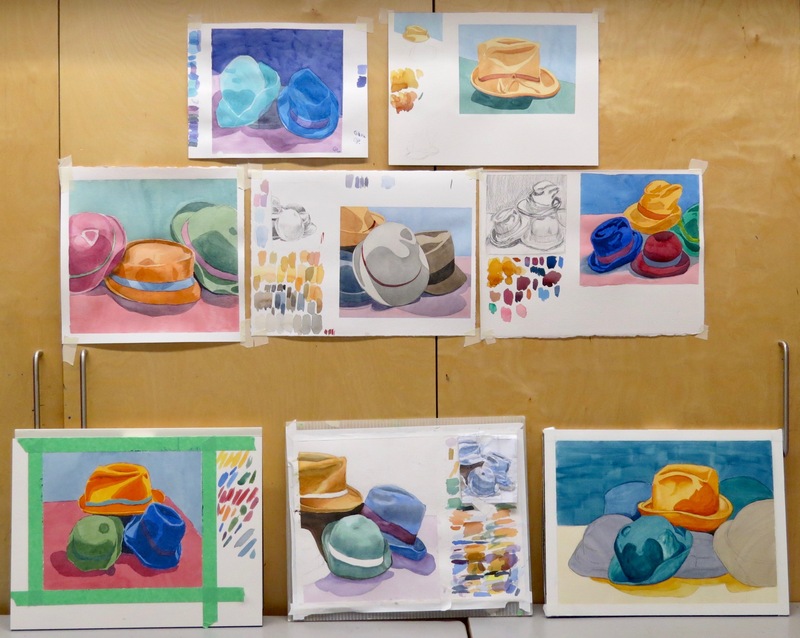 Hats were our subject at the Dundas Valley School of Art last Wednesday evening. We’d focused on value for our first class and worked with monochrome washes. This time, we were more than ready for colour but I still discussed value to start off. You can see my pencil study on the upper left of the demonstration sheet. My little notes on the sheet mean: Light to Dark, Big to Small and Soft to Crisp. These aren’t hard and fast rules but are good watercolour guidelines. I suggested that the students focus on observation of value and shape. They worked wet over dry and didn’t concern themselves with soft edges. We’ll be discussing soft edge in our next class. I liked the results of our second evening together and look forward to the weeks to come. Winter Wednesday Watercolour at DVSA – Final Class! Wednesday evening was our last of eight classes this winter at the Dundas Valley School of Art. Attendance has been excellent and everyone was present for our rusty and dusty still-life. My demonstration is a small painting, about 8 x 8″ or so. I worked very quickly and, as I painted, I reviewed several of the ideas and techniques from the prior classes. I even threw in a few new thoughts. 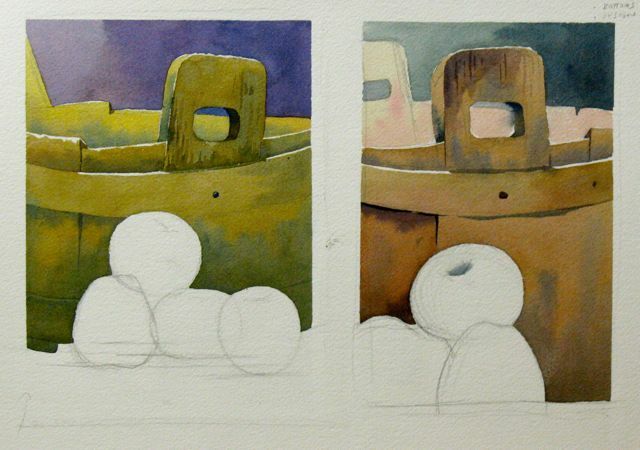 The bluish object on the left was painted right over the background, for instance. 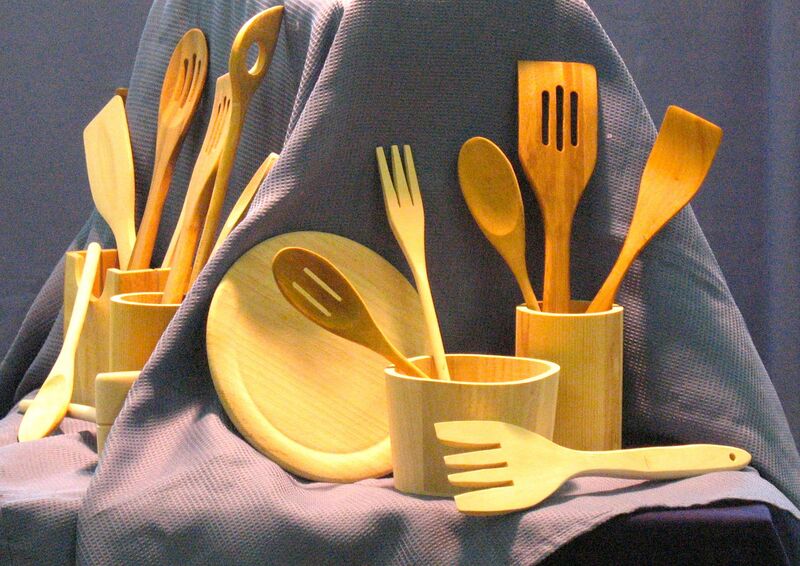 I also cropped very tightly, thinking that the most interesting parts of the objects were the handles and spouts. 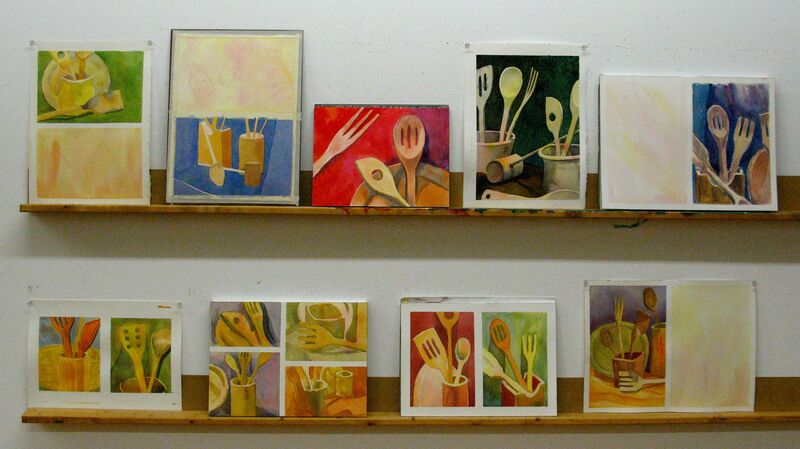 I’ve seen a lot of progress with the student’s paintings and I’m grateful for their enthusiasm and hard work. They also paid attention although nobody cropped their composition nearly as much as I did. This spring, I’ll be teaching four one-day pen and ink workshops (some with watercolour) at DVSA. Next fall, I hope to offer another series of evening watercolour classes. For now, thanks go out to my great bunch of watercolourists and to all of you for following. 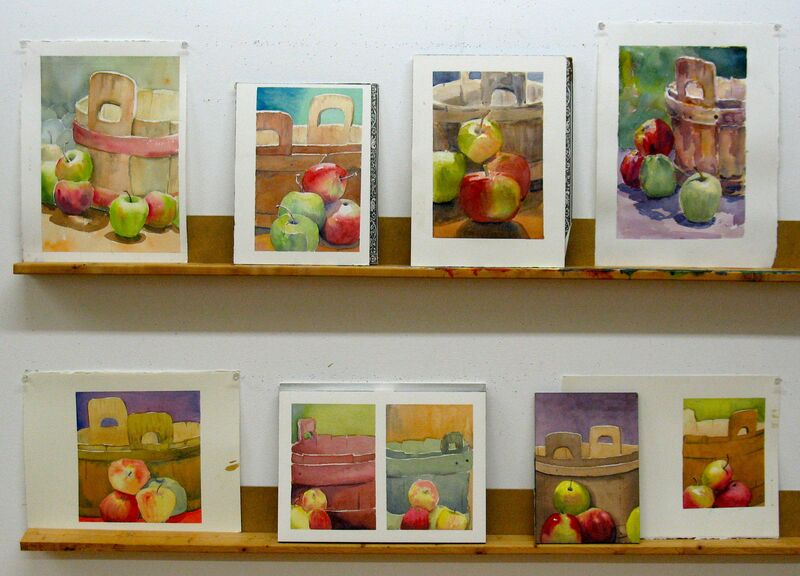 This is the other side of our still life from the Sustained Saturday class last weekend. It’s a tricky subject and I did my best to simplify the various elements of the challenge. As on Saturday, I discussed the drawing of ellipses and also offered suggestions about how to handle the crate and it’s relationship to the cups and mugs. I thought I might experience a mutiny when the Tuesday students saw the still life. There were a few nervous remarks as they entered the studio. As usual, however, they accepted the task and worked hard. It was a good learning experience and the classes ended on a very positive note. 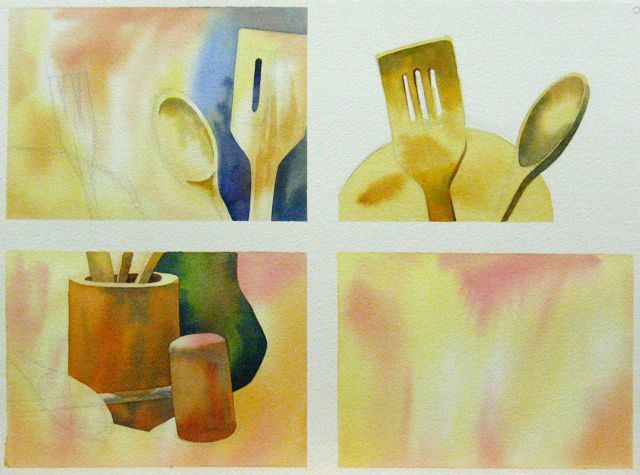 Spring Sustained Watercolour Class – April 11! The title of my still life is ‘Farewell to Winter’. Tidy up your mud room; warm weather is finally on the way! Or, so we’re told. Soft shapes are always a challenge and soft-edge techniques can help to convey them. During my demonstration, I reviewed some of these techniques and stressed, as I usually do, a ‘light to dark’ and ‘big to small’ process. The still life gave us an opportunity to mix blacks, as well. I used a combination of Cobalt Blue and Burnt Sienna for my blacks. However, a look at the upper area of the toque and the lunch bag will reveal very diluted blacks, thinned with water, where the light is being received most strongly. 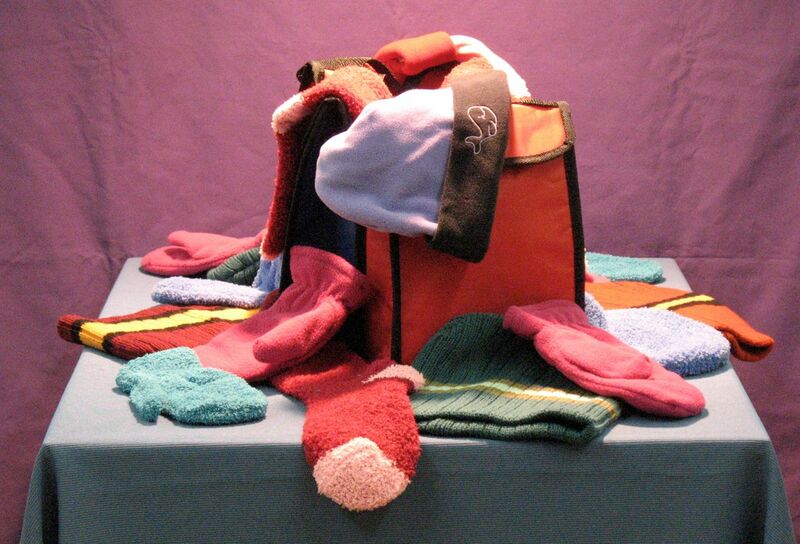 Another subject was the multi-coloured patterns on the toques and socks. I try to avoid painting things like stripes side by side, if possible. 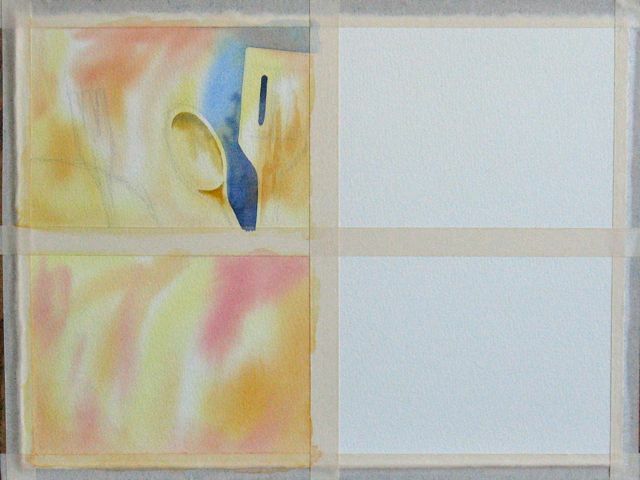 The toque on the upper right of the sheet was painted with an overall yellow wash. When dry, the red and black were painted over the yellow. The sock was painted a light pink and, while wet, I touched in a bluish shadow. I later added the darker pink. Sometimes, this approach doesn’t work. For example, I couldn’t paint a bright red over a dark green and retain the intensity of the red. A Sustained Saturday is a full day at the office. 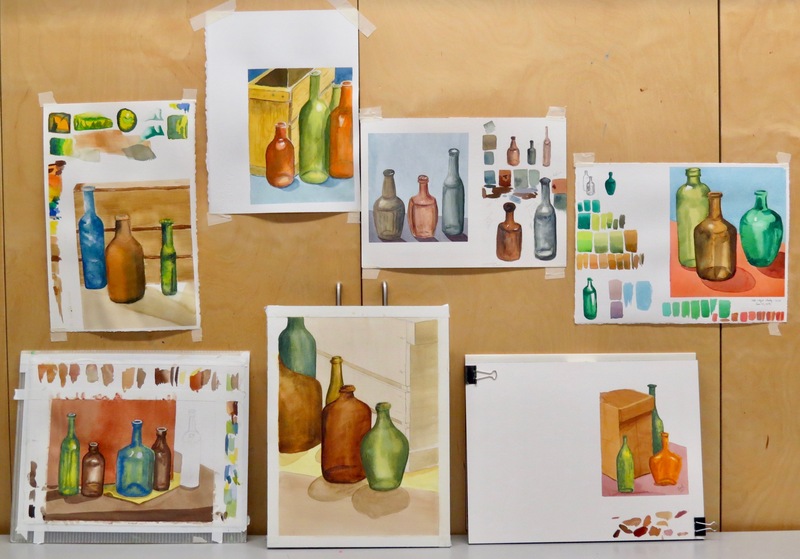 Most of the students spend the morning hours on thumbnails and studies before settling into a sustained work. Some work bigger than others and some complete more than one painting. Our critique at the end of the day summarizes the experience in an educational and enjoyable manner. It seems early but Fall term at my studio is over. Our last day of classes is always enjoyable. The morning group finished up with lunch at Piri Piri Grill House, a local Portugese restaurant. The evening class partook of some wine and cheese. I’m not sure how many paint brushes were inadvertently dipped into wine glasses. 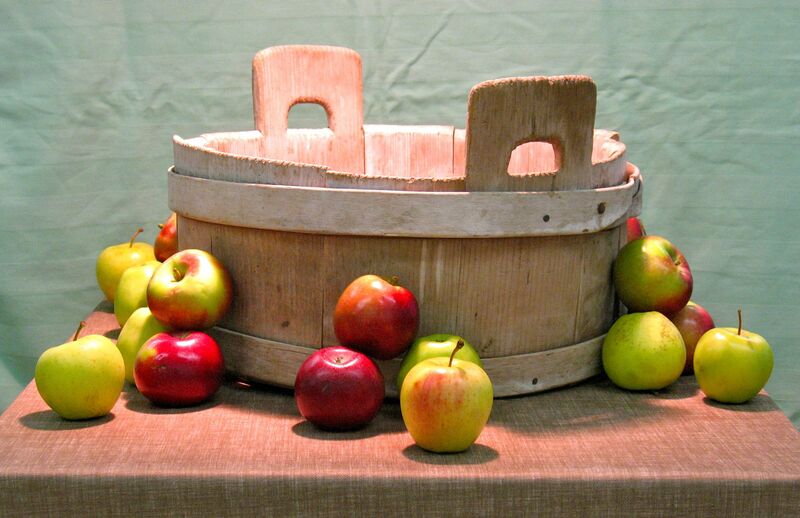 I wanted the students to concentrate on the relationship between the apples and the old tub. My first suggest was to zoom in and create a closely-cropped compostion. Then, in order to make the relationship more dynamic, I shrunk the tub a bit and slightly enlarged the apples. Another consideration was the placement of the handles. Not everyone had a point of view that showed the handles close to the apples. The solution was to use some artistic licence and shift the handles into a more effective position. Overall, we made a lot of design decisions for the sake of composition. One of my new students, Christine, has documented her progress over the ten weeks on her website. Have a look at christinedemerchant.com. Christine worked hard in class but also did a lot of homework and it really paid off. 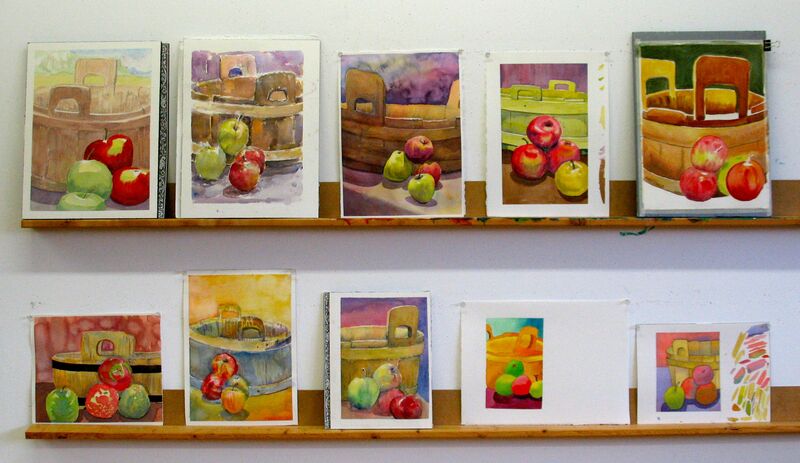 Her apples are in the top row of the AM Critique, second from the right. My Winter Studio Calendar is already posted and the term starts on Tueday, January 8. Why don’t you join us for some drawing and painting? Also, have a look at Shades of Gray, an excellent drawing workshop led by Scott Cooper. He’ll be offering this one-day workshop at my studio on Saturday, February 23. Contact him here for information. Thanks for following and commenting. Fall term may be over but I have a lot of posts planned about my various art activities. Don’t touch that dial! One of my evening students walked into the studio, looked at the still-life and said ‘Cook much?’ I probably don’t cook as much as I should but I do enjoy the way these objects take the light. 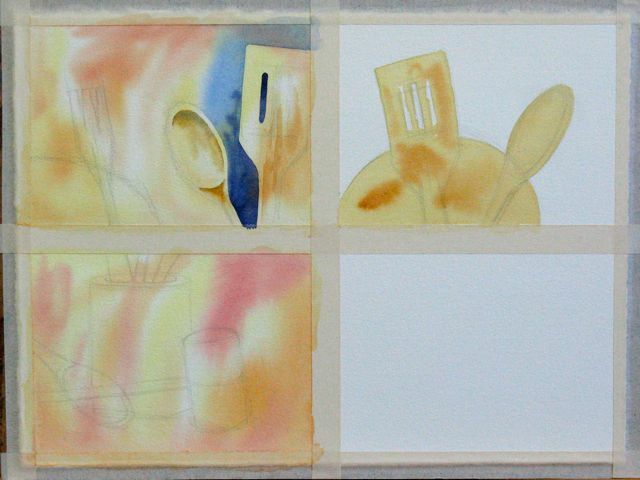 I suggested the students start their watercolours with a preliminary wash of warm colours. The sheet was covered with a wash of clean water and, while wet, yellows and golds and reds were touched in and allowed to run. We’ve been practicing techniques that can give a shape a sharp edge in one area and a softly graded edge in another. Take a look at the shadow shape in the bowl of the spoon. I demonstrated for both classes today, as usual, and worked a bit more on the demos during the evening class. 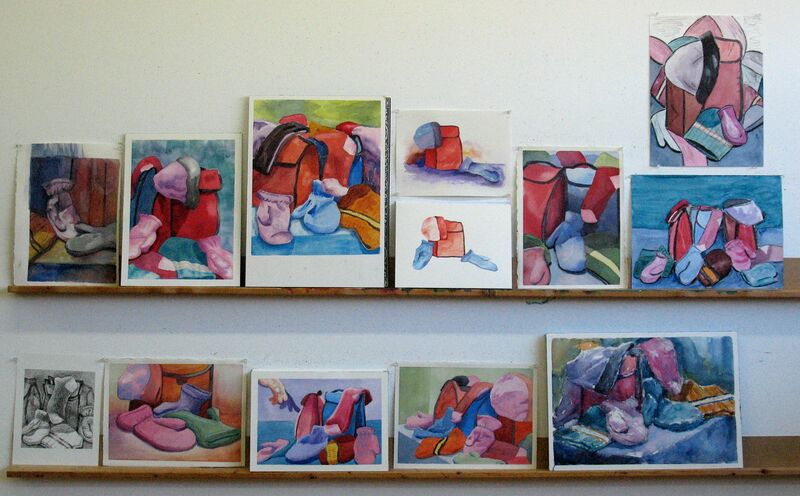 I didn’t finish them because I like to show them at different stages of development. 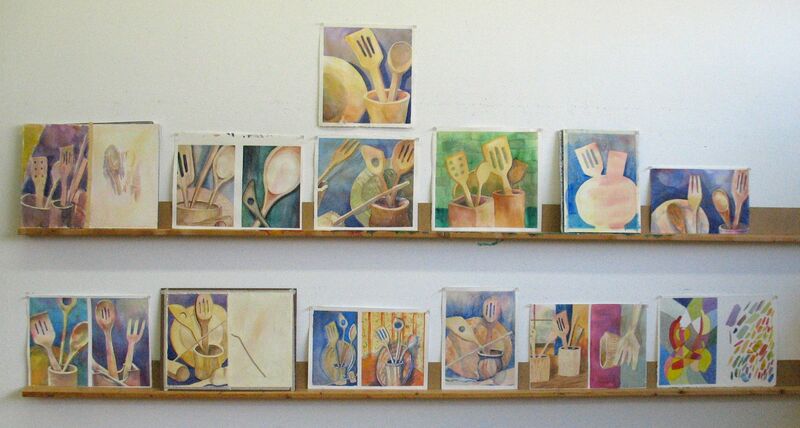 These spoons and ladles are tougher to paint than they might look and some of the students struggled a bit. Struggle is good. 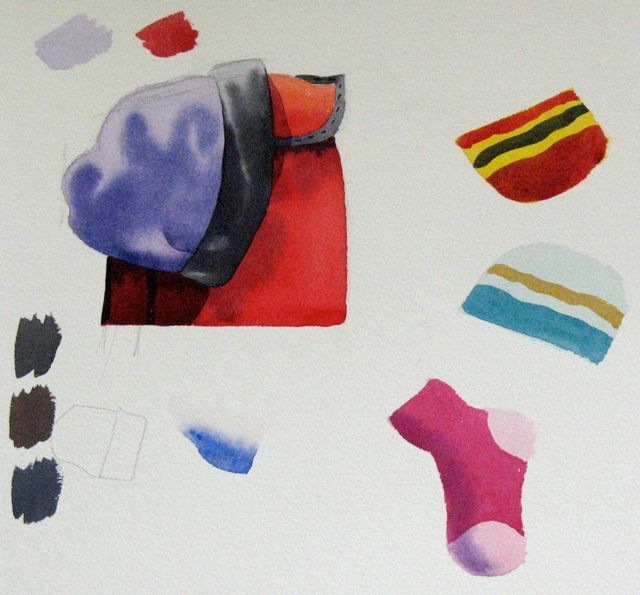 Watercolour is a challenging medium and not renowned for 100% success rates. It’s a medium that rewards hard-work and thick skin. Next Tuesday, I’ll cook up a new still-life and everyone will roll up their sleeves and try to solve a new painting problem.